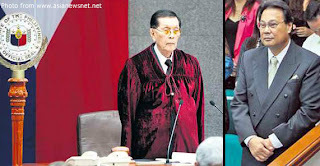 Almost half a year of a sometimes intriguing, sometimes fascinating and sometimes downright monotonous impeachment trial ended this afternoon with the Philippine Senate voting to impeach or acquit Chief Justice Renato Corona of charges filed against him in the House of Representatives last December. It had been generally believed as the impeachment trial went along that the impeachment vote would subsequently come down to a crucial vote on Article II, which focused on his alleged failure to accurately disclose his assets, liabilities and net worth in the SALN. Sixteen votes were required to impeach the Chief Justice. With the summations by both the prosecution delivered yesterday, the Senators had overnight to do final discernment before casting their votes. Your thoughts on the verdict? Post them using the Comments Box at the bottom of this post.